Steven Hrabovsky-Kleine Suicide Memorial - Suicide.org! Steven Hrabovsky-Kleine Suicide Memorial - Suicide.org! Steven Hrabovsky-Kleine Suicide Memorial - Suicide.org! 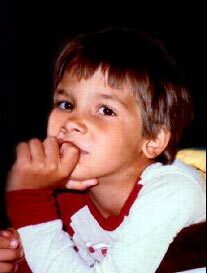 Steven Hrabovsky-Kleine was a handsome, energetic, and intelligent boy. But Steven had a very difficult life. His difficulties started when he was two-years-old and his parents divorced. After the divorce he was sent to live with his grandmother. Steven loved his grandmother deeply, but when he was four, his grandmother died from cancer. He expressed his anguish and deep sadness over losing his grandmother when he said, "I want to die and go to Heaven and be with my grandma." After his grandmother passed away, Steven stayed with his aunt, Stephanie Asher, for six months, and then moved in with his mother and her new boyfriend. Steven seemed to be doing well for a few years, but when he became a teenager he began experiencing severe mood swings, and at 16 he was diagnosed with bipolar disorder; he was prescribed medication for the disorder, and everyone assumed that he was taking his medication - but he wasn't. And because Steven was not taking his medication, his bipolar disorder drove him to attempt suicide three times. Tragically, the third time Steven attempted suicide, he died by suicide. Shortly after Steven's suicide, his mother found 11 unopened bottles of bipolar disorder medication hidden in his bedroom. Studies have shown that 25 to 50 percent of the people with bipolar disorder attempt suicide. Bipolar disorder is highly treatable, but medication must be taken to control the disorder. The medication does not cure the disorder, but manages it by stabilizing the mood swings. If the medication is not taken as prescribed, it will not be effective. Anyone who has a loved one with bipolar disorder needs to ensure that the medicine is taken as prescribed. This can be accomplished by reminding the person when to take the medication and then watching him or her take it. Untreated bipolar disorder can lead to suicide. And if someone is prescribed medication but does not take it, then they essentially are not receiving treatment. Again, remind the person with bipolar disorder to take his or her medication, and then watch to make sure that he or she takes it. Steven was a wonderful boy and is missed very deeply. In your name, Steven, and in the name of all of those who have died by suicide because of bipolar disorder, we will work diligently to prevent anyone with the disorder from dying by suicide, and we will work to educate the public about bipolar disorder and suicide.